The schnitzel is easily one of the most recognizable German specialties. 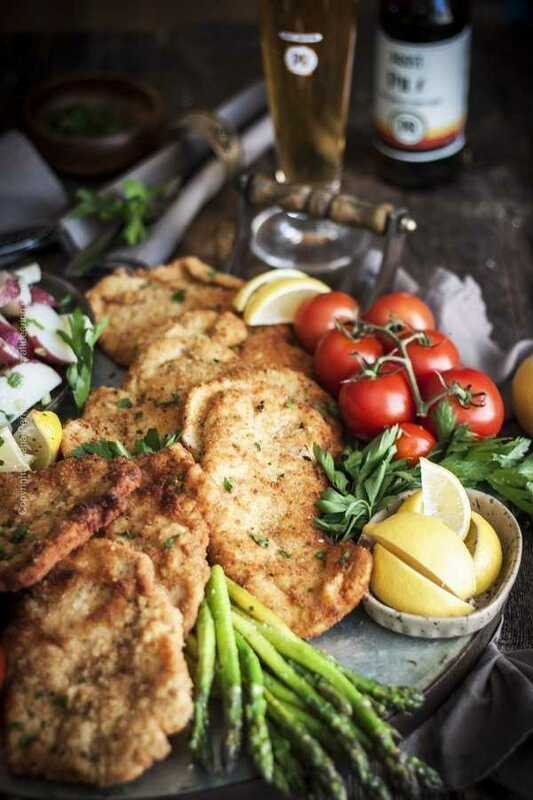 Schnitzels are delicious, go formidably well with beer (which is why they are on most beer garden menus in Germany) and are both easy and cost effective to prepare. In this post I will show you how to make a thin and crispy schnitzel. A schnitzel is a boneless, thinly sliced piece of meat, tenderized and pounded even thinner with a meat mallet, seasoned and pan-fried in cooking oil and/or butter. Translated from German the word schnitzel means ‘cut off, torn-off little piece of something‘. It does not have to be breaded, but must be pounded thin. Most people assume that a schnitzel must be breaded and cooked until golden and crispy. While this is definitely correct and applies to the most popular schnitzels enjoyed world-wide, the focus (as the name suggests) is on the thin meat rather than the breaded meat. Suppose you are making a pork Schnitzel. If your meat is thicker than a third of an inch before you cook it, you will not be making a pork schnitzel, you will be making a boneless pork chop. It is all about pounding it thin. I cannot emphasize enough how important this is. For best results Chris and I try to pound schnitzels to about 1/4 inch thickness. However, for simplicity, lets assume that you must bread the thinly pounded schnitzel before you pan-fry it. I mean… who doesn’t like crispy, fried to golden things? Where is that person? 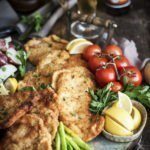 For the platter in this post I made both pork and chicken schnitzels. The step by step pictures below show the process using chicken and in the short video recipe I am using pork cutlets. a standard breading procedure set up – a bowl with flour, another one with eggs (beaten) and a third one with bread crumbs. If you’d like extra crispy schnitzels you can consider mixing Panko bread crumbs with the regular bread crumbs or use Panko bread crumbs only. By way of kitchen tools you will need a meat mallet to tenderize the meat cutlets as well as plastic wrap and a non-slip cutting board (or you can place a towel underneath your cutting board instead). cover the meat cutlets with plastic wrap and pound them with the meat mallet, then flip them over and tenderize the other side. Season with salt and pepper and then proceed through the steps of the breading procedure. First dredge in flour, shake off all the excess and dip in the beaten eggs. Finally dip each side of the cutlets (schnitzels) in bread crumbs making sure they are uniformly coated. You are then ready to pan-fry. Be sure to heat cooking oil over medium-high heat to 350 F and for best results fry two schnitzels at a time. About 2-3 minutes per side, depending on how large your pounded cutlets are. When they look golden and crispy remove from the pan and place onto a paper towels lined plate. NOTE: If you want to make sure the meat is cooked you can use a food thermometer to measure the temperature in the center of a schnitzel – you are looking for 165 F for chicken and 155 F for pork. A schnitzel is a boneless meat cutlet pounded extra thin with a meat mallet. It is then breaded and pan-fried until golden and crispy. This recipe works well for veal (Wiener schnitzel), pork or chicken schnitzels. Place two cutlets (i.e. schnitzels) at a time onto a cutting board and cover with plastic wrap. Pound with a meat mallet to tenderize and thin out. Flip on the other side, cover again and repeat. Season the tenderized schnitzels with salt and pepper on both sides. Set up a standard breading procedure of three bowls - one filled with flour, one with the eggs (beaten) and one with bread crumbs. Heat the cooking oil in a pan to 350 F.
Dredge each schnitzel in flour, shake off excess, dip in the beaten eggs, then in the bread crumbs. Make sure each cutlet is nicely covered with bread crumbs. Gently ease each schnitzel into the pan (do not overcrowd, two at a time is good) and fry for about 2-3 minutes (depending on how big the schnitzels are). Turn schnitzels over to fry the opposite side for another 2 minutes. Remove when they turn golden. Place on a paper towel lined plate and either serve immediately or transfer to a baking sheet in a 200 F oven to keep warm and crispy until it is time to serve. Wiener Schnitzel – the most famous schnitzel is known as Wiener schnitzel (Viennese schnitzel) and is made from veal meat. It is also the most expensive. It is traditionally breaded and baked. In Austria they take great pride in pounding the veal schnitzels so thin that they spread out quite large and pretty much take up the entirety of an entree plate. Pork Schnitzel – possibly the most frequently eaten schnitzel, made with pork cutlets which are significantly cheaper than veal. In Germany it is the schnitzel of choice. It is traditionally breaded and pan-fried. Chicken Schnitzel – chicken cutlets, pounded thin, breaded and pan-fried. Schnitzel Cordon Bleu – this is a pork schnitzel, stuffed with ham and cheese then breaded and pan-fried. Holstein Schnitzel – this variation is a breaded veal schnitzel served with fried egg, smoked salmon, sardines, anchovy fillets and capers. Piccata Schnitzel – has Italian origins, typically chicken cutlets dredged in flour and pan-fried with added chicken stock, lemon juice and capers. Jägerschnitzel – originally made with venison or wild boar cutlets or duck breasts and translates to “hunter’s cutlets” from German. It is always served with a thick, gravy-like sauce with mushrooms. Does not have to breaded, just dredged in flour. Vegetarian Schnitzel – a thinly sliced eggplant or other suitable vegetable such as squash. Breaded and pan-fried in the manner of pork schnitzel. Just like the eggplant schnitzel below I dished up recently. I love to drizzle it with a vinaigrette of finely chopped parsley, minced fresh garlic, salt and pepper, red wine vinegar and olive oil (all to taste, I go heavy on the vinegar because it beautifully cuts through the crispy fried coating and soft inner flesh of the eggplant). Schnitzel is best served as soon as it is prepared. Let it sit on a paper towel to drain for a minute and then serve immediately. This is great advice if you are cooking two to four schnitzels, but not as much if you are making a dozen or more at the same time like I did for this platter. What to do in such a situation? When cooking multiple schnitzels they can get cold and soggy pretty quickly. To keep cooked schnitzels crispy and warm turn your oven to about 200 F and place inside a baking sheet lined with parchment paper. Pan-fry your schnitzels, drain them on paper towels lined plate for up to a minute and then transfer them to the oven. Continue to make the rest of the schnitzels and repeat the same steps until you are done. Then transfer them all onto a pre-garnished platter and serve with your choice of sides. Schnitzels pair famously with a variety of German beer styles. Our favorite are crisp and clean Bavarian lagers such as Prost Brewing Co. Helles and Pils. And if their Maibock or Märzen style lagers are in season you bet we’ll be having one of them. This post is part of our Oktoberfest Bash 2018 series. Every year, we partner with other bloggers to bring you a veritable feast of Oktoberfest recipes. I encourage you to enter the Oktoberfest Bash contest for a chance to win a whole case of Oktoberfest beer brewed and provided by Prost Brewing Co. in Denver, Colorado. You can learn more about their incredible commitment to brewing authentic tasting German beer in this post. The prize will be shipped directly by the brewery to the winner of the giveaway. The winner will be announced on September 28th! Contest | is now closed| open to residents of the 48 contiguous states only. Must be 21+ years old to enter. Good luck! Hi! Visiting from the Snickerdoodle Create and Make party. Hope you share this at the What’s for Dinner party too! I see you already visited us!! Thanks – I love a good schnitzel!! My German step mom used to make an amazing one! Have an awesome week! Oh I absolutely love schnitzels!!! This took me back to my Berlin days!! Amazing recipe. Very informative, fantastic snaps, and yum yum schnitzel! Everything looks absolutely amaaaazing! Prost! Crispy Goodness! Looks good Milena! wow that looks so appetizing!!! My dad always makes beef like this!! He loves schnitzel. Pinning this to show him!! Thanks for hosting the Oktoberfest Bash, it was super fun!!! Thank you so much, sweet girl! You are an inspiration and we love your work! Thank you for being a part of all the fun. Don’t think we’ve ever seen better Bavarian Cream Donuts than yours! Schnitzel is so delish! I always go for the pork schnitzel. A platter of it is a fantastic idea for an Oktoberfest party! I sure didn’t know that schnitzel doesn’t need to be breaded! I always thought that’s what makes it schnitzel lol! Though I always make sure it’s pounded thin! Schnitzel is well-loved in our family! My favorite is Wiener and pork schnitzels, but really, any schnitzel will do for me. Beautifully photographed too!!! Lol, I hear you. For the longest time I thought they were all breaded and once in Germany ordered a Jägerschnitzel and was surprised that it was not. Otherwise delicious:) So the waitress enlightened me, haha. The crust on those schnitzels look absolutely perfect! I’m such a sucker for a good, crispy schnitzel and a beer on the side. Those potatoes look great too. Can’t wait to make this for our Oktoberfest celebrations! Prost, Amanda! You do have impeccable taste:) We should meet up at Prost’s Denver brewery soon and drink some beers! Seriously? What? You MUST come stay with us, I will make another platter. They go fast. When I was pregnant, Chris would make 4 schnitzels for dinner. I’d eat three, he’d have one. They are like chicken nuggets for adults, I swear! I’d also like to meet the person who doesn’t like crispy fried foods. How is that even possible? Your schnitzel looks SOOOO crispy and delicious! Thank you again for putting the Oktoberfest Bash together. I’m having so much fun looking through all the recipes! Right? Where is that person, lol. I really love the Donnauwellen Kuchen! You always make awesome German desserts, the Bienenstitch last year was epic too. This is my kind of platter!! The entire round-up is a gorgeous one! I’d say it’s time to celebrate! Thank you for including me in this fun event! Now I must go make some schnitzel! Shared! Thank you, Annie! We will definitely be eating brats and schnitzels again here soon I will be sure to make your Bratkertoffeln instead of potato salad. So much better:) Prost! Will be a great weekend! I can’t believe a year has gone by since the last Oktoberfest! Crazy how fast the time flies! Love the idea of a schnitzel platter…who would have thought there would be so many options!! A big platter of this, some beer and I’m happy 🙂 Cheers! You are right! Time goes by waaaay to fast. But so long as there is good beer:) Thank you so much!